When I finish a good book, I am generally struck with an intense desire to share this book with others that I know will enjoy it as well. As such, the majority of the books left on my shelf remain unread, as those that I have read are almost immediately passed on to another reader. Sadly, though, these books have a tendency to remain away from their shelves. Maybe I should think of this as a good thing - after all, the piles of books around my nightstand and on the floor by my shelf are becoming a danger to my health. But I tend to miss those books I've read, especially when I want to turn back into them. As such, I've begun writing my name in my books (yes, I write in my books... that's enough of a discussion for a separate post, though). I also write the month and year I read the book, just for posterity's sake. I'm sure you are all wondering where I'm going with this rambling discourse on my booklending habits... but I promise, I do have a point. The point is I have found cold, hard evidence that I am not alone in this. There are others who pass their books along to other readers and would like to one day get them back. For people like us, there is The Personal Library Kit. It really does exist. Really. 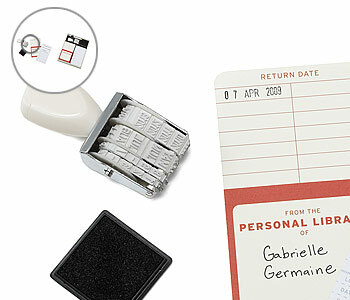 And it comes with a date stamp, and adhesive pockets, and lending cards, and a "genuine mini library pencil." I need to do the same, but with music. (I lend a lot of music, but I tend to hold on to my reading books.) So far, I have remembered to put return labels in the books, but I have yet to write down to whom I have lent the book. One step at a time, I guess, at least for me. I like the idea of a library kit. This is a neat gift for a book lender. Lately I tend to use Evernote (a website for keeping notes) for whenever I loan out a book. I can look up by tag, such as "loan" and all notes come up. But I'm sure there are many books that I've loaned out that I've forgotten. You'd also love the beautiful but highly unaffordable book shelves I saw at ABC Carpet, which had little metal label holders on each shelf so you can mark and tag sections...we can dream, can't we.